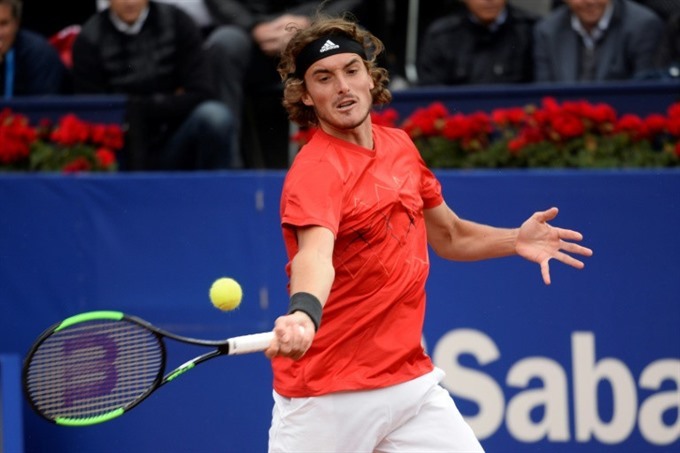 ESTORIL, Portugal -- Greek rising star Stefanos Tsitsipas continued his excellent form on clay by beating Estoril Open top seed Kevin Anderson 6-7 (3-7), 6-3, 6-3 on Thursday to reach the quarter-finals. The 19-year-old held the big-hitting South African to just four aces in a second-round match which lasted for more than two hours in windy conditions. World number 44 Tsitsipas beat three top-20 players, including Dominic Thiem, en route to the Barcelona Open final last week, where he lost to Rafael Nadal. Anderson, ranked eighth, sealed his fate as his first double-fault of the contest brought up two match points, with Tsitsipas quickly wrapping up victory at the first attempt. "It was really tough, with tricky conditions," world number eight Anderson said. "I’ve not played a match in a while. "It’s a little disappointing, I would have preferred better conditions for my first match back, a more comfortable environment. "But he was just too good today." Tsitsipas, the first Greek man to break into the world’s top 50, improved to 13-10 for the season. He will face a last-eight match against Spain’s Roberto Carballes Baena, who knocked out British number three Cameron Norrie 5-7, 6-2, 7-6 (7/1). The 103rd-ranked Norrie went down in three hours, eight minutes to his Spanish opponent who won his first ATP title this season in Quito. Norrie let a 5-2 lead in the final set slip away and wasted three match points while serving for victory leading 5-3, missing out on the first ATP quarter-final of his career. The doubles run of former world number one Lleyton Hewitt and teenager Alex de Minaur came to an end as the Australian pair lost 6-4, 7-6 (7/4) to Norrie and Kyle Edmund. "We we hung in there well, it was hard to play clean tennis out there,"
Hewitt said. "You just have to try and make as many shots as possible in the wind. "We fought hard and got back into both sets. If we’d been able to sneak one, the match would have gone to a super-tiebreaker. "It was disappointing to end up losing."